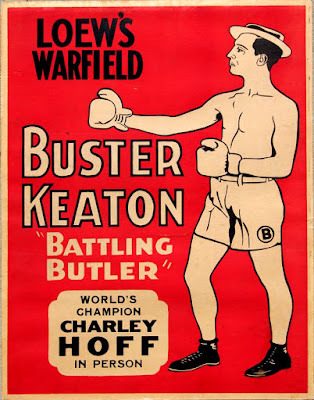 A vintage poster for 'Battling Butler' that renders the athletic Keaton as unusually scrawny. 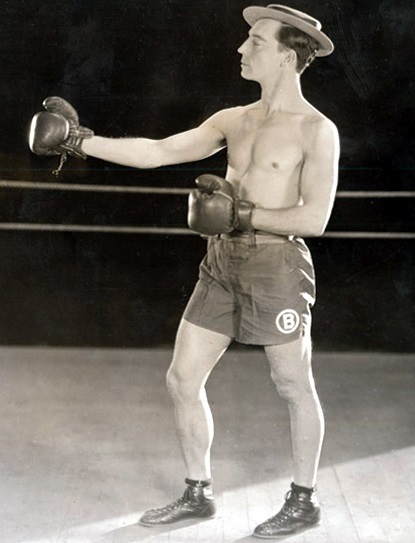 Next up: Buster Keaton's boxing comedy 'Battling Butler' (1926). I'm doing live music for this film on Thursday, June 2 at the Leavitt Theatre in Ogunquit, Maine. Details about the screening are in the press release below. But one thing about this film that has always impressed me is how it shows Keaton's sure instinct for story construction. The storyline for 'Battling Butler' was taken from a popular stage play about a meek millionaire who must train to fight a champion in the ring. In the play, the story climaxes in the dressing room just before the fight, when the millionaire finds out he doesn't have to face the champion. Happy ending! However, in transferring the story to the screen, Keaton knew his character and his audience well enough to know the non-fight ending just wasn't going to work. To quote Keaton himiself in a late-in-life interview: "But we knew better than to do that to a motion-picture audience. We couldn’t promise ’em for seven reels that I was goin’ to fight in the ring and then not fight. We knew that we had to fight." So they changed the story accordingly—and the result was Keaton's highest-grossing film of the 1920s. Keaton in 'Battling Butler' (1926). How did Keaton know to do this? There was no film school at the time, and Keaton never went to any traditional school, either. He spent his childhood touring in the family vaudeville act. I suspect that over the years, he absorbed so much about how theater audiences react that his sense of what would work in a story and what wouldn't was instinctual. He just knew. Keaton structured his Civil War story to put his role on the Confederate side, because he said (again, in a late-in-life interview) "You can always make villains out of the Northerners, but you cannot make a villain out of the South." Why? Because the South lost? I don't know. By the way, I'm accompanying a screening of 'The General' on Friday, June 10 at Red River Theatres in Concord, N.H. More about later. For now, I hope you'll join us this Thursday to see Buster Keaton lace up the gloves in 'Battling Butler' (1926). The press release is below. See you there! A vintage poster for 'Battling Butler' (1926). OGUNQUIT, Maine—He never smiled on camera, earning him the nickname of "the Great Stone Face." But Buster Keaton's comedies rocked Hollywood's silent era with laughter throughout the 1920s. The one-time screening will feature live music performed by Jeff Rapsis. Tickets are $10 per person. 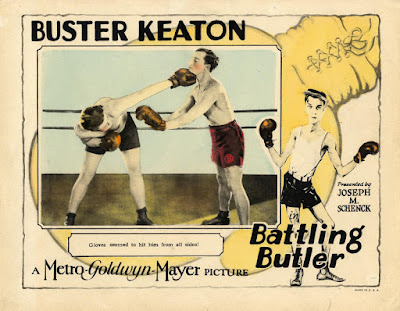 In 'Battling Butler,' Keaton plays Alfred Butler, a pampered millionaire who is mistaken for a boxer with a similar name. The mix-up gives the meek Butler the chance to pretend he's a prizefighter to impress the family of the woman he loves. But then Keaton is forced to enter training for a high-stakes championship bout, with surprising results. The boxing scenes gave Keaton ample opportunity to wring physical comedy out of the fight game, which at the time rivaled baseball in popularity. 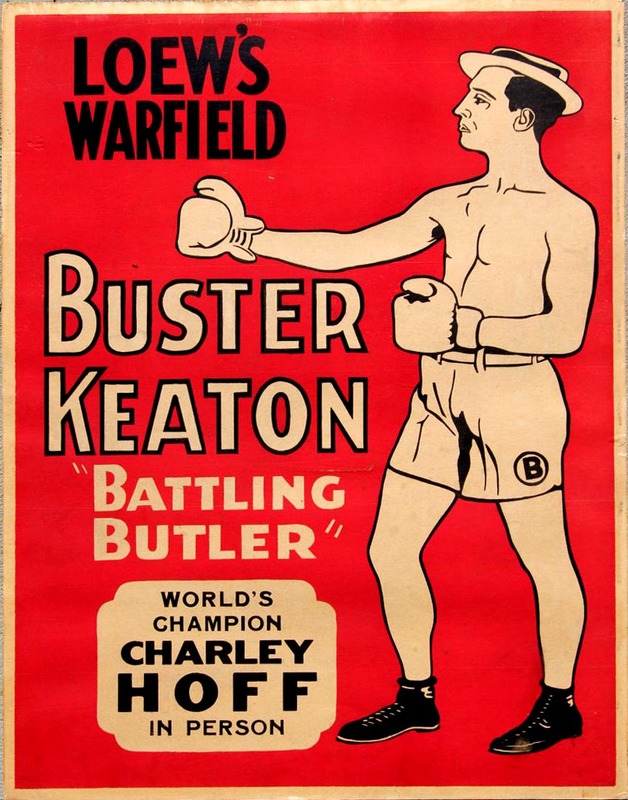 Based on a story adapted from a popular stage play, 'Battling Butler' was Keaton's highest-grossing silent feature film and the high point of his 1920s stardom. Today Keaton, along with Charlie Chaplin and Harold Lloyd, stands as one of the three great clowns of the silent screen. Many critics regard Keaton as the best of all; Roger Ebert wrote in 2002 that "in an extraordinary period from 1920 to 1929, (Keaton) worked without interruption on a series of films that make him, arguably, the greatest actor-director in the history of the movies." In reviving 'Battling Butler' and other great films of cinema's early years, organizers of Leavitt's silent film series aim to show classic movies as they were meant to be seen—in high quality prints, on a large screen, with live music, and with an audience. • Thursday, June 23 at 8 p.m.: 'Don Q, Son of Zorro' (1925), Douglas Fairbanks Sr. stars in this sequel to his immensely popular 'Mark of Zorro,' which opened this season's silent film series. • Thursday, July 7 at 8 p.m.: 'A Sailor-Made Man' (1921), uproarious send-up of Navy life helped establish Harold Lloyd as a top-tier silent film comic. • Thursday, July 21 at 8 p.m.: 'Tess of the Storm Country' (1922), Mary Pickford's intense melodrama with a classic Yuletide finish. Christmas in July! • Thursday, Aug. 25 at 8 p.m.: 'Son of the Sheik' (1926), final appearance of silent screen icon Rudolph Valentino on the 90th anniversary of his death. Buster Keaton's comedy 'Battling Butler' (1926) will be shown with live music on Thursday, June 2 at 8 p.m. at the Leavitt Fine Arts Theatre, 259 Main St. Route 1, Ogunquit, Maine; (207) 646-3123; admission is $10 per person, general seating. For more information, visit www.leavittheatre.com. For more info on the music, visit www.jeffrapsis.com. 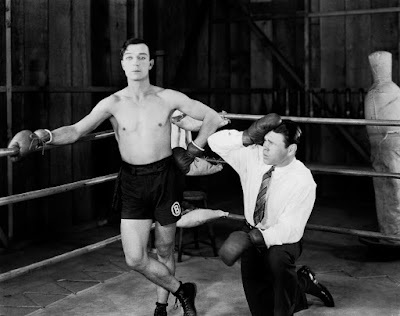 of boxing on the silent screen in Wilton, N.H.
Buster Keaton in 'Battling Butler' (1926). Even if boxing isn't your bag, I hope you'll join us for a series of silent films this summer that center on the sweet science. It's at the Wilton (N.H.) Town Hall Theatre, where we'll run boxing-related dramas, comedies, and love stories in the coming months. Several heavyweight filmmakers headline the action, with Alfred Hitchcock and Buster Keaton among them. But the undercard includes many other hopefuls and wanna-bes, all eager for their shot in the ring. First up is 'Dress Parade' (1927), a Cecil B. DeMille drama starring William Boyd as a prizefighter who falls for the daughter of a West Point Commandant. Boyd would later go on to lasting fame as cowboy hero Hopalong Cassidy. "Dress Parade" was filmed on location at West Point, and so doubles as our annual Memorial Day weekend silent film tribute. Actually, it's more of a military story than a boxing tale, and so it'll serve as a transition into the boxing flicks. The screening is Sunday, May 29 at 4:30 p.m, at the Town Hall Theatre, 40 Main St., Wilton, N.H. Live music is by me. Admission is free, with a suggested donation of $5 per person to defray expenses. A full line-up of the other contenders in our boxing series is found in the press release below. Taken as a whole, these movies form a time capsule into an era when boxing rivaled baseball as the nation's most popular sport. That's no longer the case, of course, especially with today's emphasis on safety and injury prevention. But back in the 1920s, the fight game enjoyed a national popularity that extended right down to the grassroots. Neighborhoods, ethnic groups, you name it: every town had a fight arena, and just about everyone had a favorite fighter to root for. And kids idolized champions such as Jack Dempsey, whose "long count" bout with Gene Tunney in 1927 was one of the era's big stories. This popularity is reflected in the movies of the time. Watch films from the silent era, and you'll find boxing a constant presence. Consider that all the great silent comedians—Chaplin, Keaton, Lloyd, Langdon—spent time in the prize ring. Just last night at Red River Theatres in Concord, N.H., I introduced a screening of Chaplin's 'City Lights' (1931). Judging from audience reaction, the superbly choreographed boxing scene was the highlight of the evening. So boxing, and the struggle it symbolized, was regarded as part of everyday life. Moreover, boxing was visual. Words weren't necessary to tell the story of two men pushed to their physical limits and striving to beat each other into submission. So moviemakers were naturally inclined to use boxing and its world as a setting for their stories. By the way, I say "men" because at the time, boxing was completely male-dominated. Female boxing, if it occurred at all, was considered a novelty. In an era of sharply defined gender roles, a woman just didn't do such things as fight in the ring. Surprisingly, female boxing does show up in some silent films, although usually as a gimmick. One example is Clara Bow's 'Roughhouse Rosie' (1927), in which Bow gets her men "by treating them rough!" It's a film that, alas, no longer survives. Filmmakers also sometimes used boxing's raw physicality to punch up the visuals, so to speak. 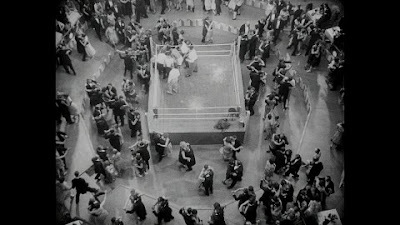 There's a remarkable night club scene in Fritz Lang's film 'Spies' (1928) where two boxers in a makeshift ring beat each other senseless while a glittering society crowd looks on. From Fritz Lang's 'Spies' (1928). When one finally succumbs, a band strikes up, and dancing couples immediately crowd onto the floor to foxtrot. Among them are the protagonist and the mysterious woman he is battling, so I can see where Lang was going. Well, boxing is no longer mainstream. But the elemental nature of the sport retains its fascination, I think, and also its status as a vivid metaphor for—well, everything. It's sport reduced to its essence: two competitors facing each other in a battle for victory. What could be simpler? And it was George Foreman who observed that boxing is "the sport to which all other sports aspire." 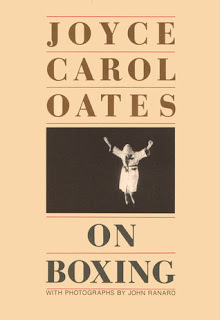 It continues to inspire writers, including Joyce Carol Oates, whose "On Boxing" is a minor modern classic, I think. And it's still with us. Even if you've never set foot in a fight arena, you've used the language and imagery of boxing, which pervades everyday conversation. Consider: a beautiful woman is a knockout. A supportive friend is in your corner. To persevere is to go the distance. A setback is a body blow. To give up is to throw in the towel. All these are boxing phrases. To do something against the rules is hitting below the belt. And if you want to really hurt someone, the gloves come off. That last phrase is a strange one. In boxing, the gloves actually allow more damage because they protect a fighter's hands. I once thought to show someone the ropes was a boxing phrase, but it actually comes from sailing. Well, whatever phrasing you use...I find that in a complex world of uncertainties and interdependencies and compromises, the direct simplicity of boxing can be refreshing. I'm no fan of violence, and don't wish a concussion on anyone. But to me, boxing is a way for us to explore and express the aggressive side of our nature. Just as the simplicity of silent film allows us to reconnect with big primal emotions, boxing allows us to experience being alive in a physical way that's intense and riveting and unlike any other. The bell rings this weekend with 'Dress Parade' on Sunday, May 29 at 4:30 p.m. at the Town Hall Theatre in Wilton, N.H. Below is the press release with info about other films in the series. 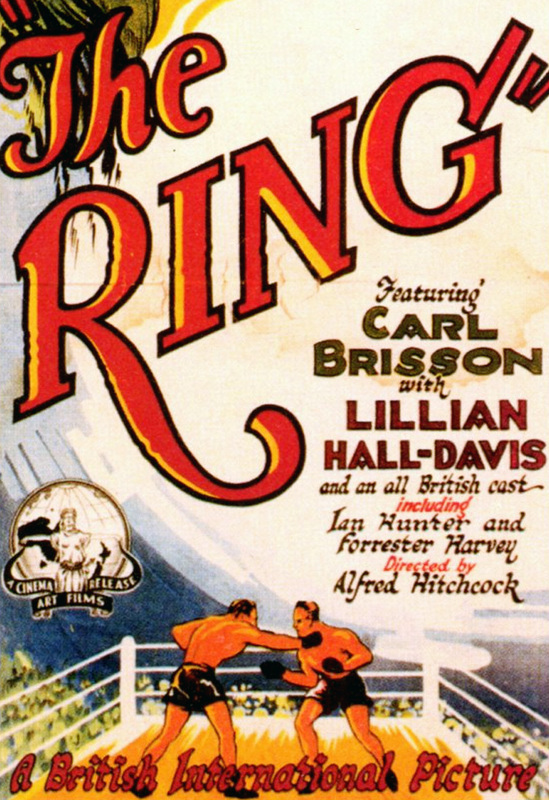 On the fight card: Hitchcock's early drama 'The Ring' (1927). 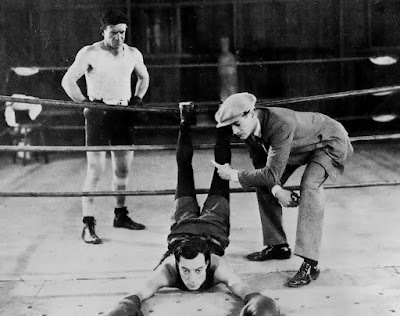 WILTON, N.H.—Alfred Hitchcock and Buster Keaton are among filmmakers featured in a summer series of vintage boxing movies at the Town Hall Theatre. The series opens on Memorial Day weekend with a screening on Sunday, May 29 of 'Dress Parade' (1927), a drama filmed on location at the U.S. Military Academy at West Point. All movies in the series are from the silent film era, and will be presented with live music by Jeff Rapsis, a New Hampshire-based silent film accompanist. "At the time these films were made, boxing rivaled baseball in mainstream popularity in the United States," Rapsis said. "So early on, filmmakers naturally turned to the boxing world as a great source of drama, action, and visual excitement. In the silent era, it was a popular sub-genre." The boxing films are part of the Wilton Town Hall Theatre's ongoing monthly silent film series. Admission to the screenings is free; a donation of $5 per person is suggested. 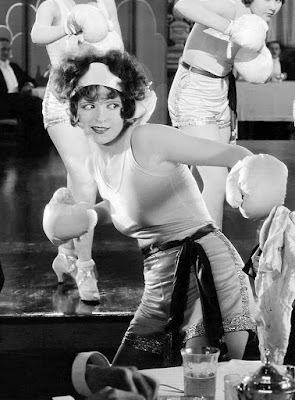 The Town Hall Theatre's "Summer Boxing Series" opens on Sunday, May 29 at 4:30 p.m. with 'Dress Parade' (1927). Produced by Cecil B. Demille and released by MGM, 'Dress Parade' is the story of an amateur boxer who enrolls in West Point, where he must battle for the affection of the Commandant's daughter. The film stars a young William Boyd, who would later achieve enduring fame as Hopalong Cassidy in countless Hollywood Westerns. 'Dress Parade' includes scenes filmed on location at West Point, which prompted its screening on Memorial Day weekend. Other titles in the Summer Boxing Series include Alfred Hitchcock's early boxing drama 'The Ring' (1927) on Sunday, July 24. "Hitchcock's drama of two fighters in love with the same woman shows many of the characteristics that would later earn him the nickname 'The Master of Suspense,' " Rapsis said. The series will also include several vintage boxing-themed short films. Silent-era boxing dramas are of particular interest to sports buffs because they're filled with scenes of the fight game at the height of its mainstream popularity. "As an elemental contest between two people, boxing inspired early filmmakers to do some of their best work," Rapsis said. "It's a very visual sport that lends itself to the movies." All shows in the silent film series start at 4:30 p.m. The Town Hall Theatre's screenings are free and open to the public; a donation of $5 per person is suggested to help defray expenses. "Even if you're not a boxing fan, each of these movies offers a great story told at a fast pace," Rapsis said. "These films were designed to be crowd-pleasers, and they still work today. They're the kind of films that caused audiences to first fall in love with the movies." 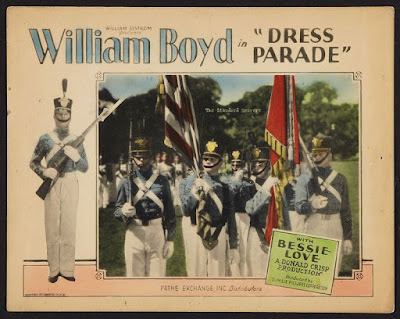 • Sunday, May 29, 4:30 p.m.: 'Dress Parade' (1927) starring William Boyd, Bessie Love. An amateur boxing champ visits the U.S. Military Academy and falls for the commandant's daughter. He wins an appointment to the Academy and then begins a rivalry for her affection. Our annual Memorial Day weekend program, filmed on location at West Point! • Sunday, July 3, 4:30 p.m.: A Boxing Double Feature. A two-fisted pair of vintage silent boxing tales. In 'Battling Bunyan' (1924), a young mechanic turns to the prize ring to earn money to start his auto repair business; in 'The Shock Punch' (1925), a boxer takes a construction job only to find his boss is a former opponent he once defeated in the ring. ADDITIONAL SHOW! • Sunday, July 17, 4:30 p.m.: Melodramas that Pack a Punch! Up first is 'The Battling Fool' (1924), in which a minister's son takes up boxing. In 'American Pluck' (1925), a cowboy-turned-prizefighter comes to the rescue of a visiting foreign princess. • Sunday, July 24, 4:30 p.m.: 'The Ring' (1927) directed by Alfred Hitchcock. The master of suspense was very young, and still in England, when he made this silent drama about two boxers in love with the same woman. Who will win the fight for her heart? Full of trademark Hitchcock touches even at this early stage in his career. • Sunday, Aug. 28, 4:30 p.m.: 'Battling Butler' (1926) starring Buster Keaton. 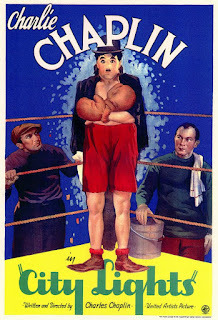 Our series of silent boxing movies concludes with Keaton's riotous comedy. Keaton plays Alfred Butler, a pampered rich idler with the same name as a feared boxing champion. When a girl he fancies thinks he's the fighter, Keaton has no choice but to start training. The Summer Silent Boxing Film Series will begin with a screening of 'Dress Parade' (1927) on Sunday, May 29 at 4:30 p.m. at the Wilton Town Hall Theatre, 60 Main St., Wilton, N.H. Admission is free; a donation of $5 per person is suggested. Hey! There's a brass band in my gate area! Getting my shoes shined this past weekend led to an unexpectedly moving experience—partly musical, and entirely human. It was Saturday, 7:30 a.m. at National Airport in Washington, D.C. I had just flown in, on my way to do silent film accompaniment at the Library of Congress that day. My dress shoes were looking pretty shabby. Why hadn't I shined them? Because the C Concourse at National Airport boasts one of one of the best shoe-shine operations around, and I was saving myself if they were open. They were! And no line. So I walked in, climbed up on the raised chair, and the age-old ritual commenced. While sitting there, the usual airline terminal white noise washed up against my ears: the murmur of passengers, the shrill boarding calls, the pre-recorded security announcements. Background noise you don't even notice. But then I heard something that caught my attention because it didn't fit in at all. It sounded like the rat-a-tat-tat of a snare drum! And not from a speaker, either. From an actual snare drum that wasn't too far away, from the sound of it. Rented a tent! Rented a tent! Rented a rented a tent! This was followed by the brassy tones of a trombone warming up, and then a clarinet, and other instruments that brought me back to my own band days. It felt like we were getting ready for Circus Night with the American Legion Post 48 Band in the parking lot of Simoneau Plaza in Nashua, N.H. Where was my tuba? Being still in mid-shine, I couldn't see what was going on. But it sure sounded to me like an ensemble tuning up prior to, say, a football game or parade. 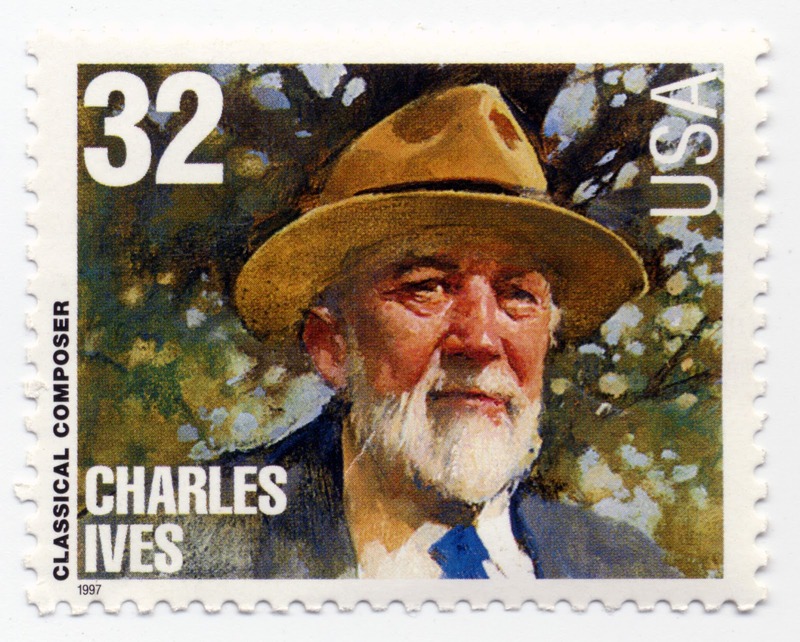 And it all somehow seemed fitting, as I've recently been rereading the Charles Ives biography by Jan Swafford, and other stuff on Ives. He's a composer close to my heart since I did a research paper on him in 10th grade. 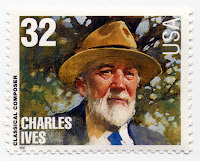 Later, Ives wrote: "In 'thinking up' music I usually have some kind of a brass band with wings on it." That's the sound I was hearing out in the corridor, coming from somewhere: the racket of a band warming up. Why? How come? As soon as my shoes were shiny, I went to find out. Across the corridor, packed into most of the space for Gate 36, was a full concert band, music stands and all. And it looked they were about to play! I still didn't get what was going on. What would prompt a band to crowd itself into an airport gate on a rainy Saturday morning? How did the bass tuba clear security? But the sheer unlikeliness of it all appealed to me, so I figured I'd stick around to hear some music. What was going on, of course, was that they were there to welcome the impending arrival of an "Honor Flight" of U.S. veterans due in soon from Fort Myers, Fla. The Honor Flight program brings veterans to the nation's capital at no charge to visit the monuments to their service. I'd heard of it, but never seen it in action. That was about to change. Soon an honor guard of active duty military personnel assembled in the gate area, flags included. Joining them were several dozen civilians holding WELCOME and THANK YOU signs, and even a passel of cheerleaders carrying pom poms. And the band? Turns out it was the Main Street Community Band from Fairfax, Va., under the capable leadership of Geoffrey K. Steffens. Even in a challenging acoustical environment, they sounded great. The warm-up session was cut short by the need to get passengers on a flight to Minneapolis out of Gate 36. But that set the stage for the arrival of the Honor Flight, an American Airlines jet carrying 150 vets not only from World War II, but also Korea and Vietnam. With the gate clear, the band resumed playing. P.A. announcements that the Honor Flight had landed further swelled the crowd. I found myself getting caught up in the moment. It was really quite moving to see all this being done to welcome vets to the nation's capital. It's always a joy to see things done well, and this was a class act all the way! The flight then pulled up. And the vets themselves didn't disappoint. Emerging from the jetway, many in wheelchairs, each was greeted by a crush of well-wishers as the band kept playing patriotic marches and all of us applauded continuously. You couldn't ask for a warmer welcome—a hero's welcome, really. Some of the vets laughed. Some posed for pictures. And a few just began flat-out sobbing. All the time that had passed, all the people that never made it, either back then or who were lost along the way—all of it carried forward to this moment of getting off a plane and being honored for what you and so many others did, in some cases so long ago. What a panorama of emotions on parade—and all on a Saturday before 9 a.m.! I couldn't help but think of how my father (himself a World War II vet) was famous for choking up at the sound of a Sousa march. There's a little of that in me, I think. It all made for great theater, not just because of the veterans but because of everyone who was part of the scene. For a little while, a bunch of passing strangers, plus the Main Street Community Band of Fairfax, Va., all came together to bring about one of those shared experiences that are a big part of what life is all about. A brass band with wings, indeed! And to me, the sheer randomness of it was exactly what life has always felt like. One minute you're getting your shoes shined. The next, you're applauding members of the Greatest Generation as a band in an airport gate area plays the Guadalcanal March. And to think I'd have missed it if I'd worn sneakers. After a half-hour, veterans were still emerging from the plane. I lingered as long as I could, but then had to get on my way to Culpeper, Va. and the Packard Campus, home to the National Audio Visual Conservation Center of the Library of Congress. The public entrance to the Packard Center. It was a rainy day: a good one to spend the afternoon in a darkened theater. I was there to do music for two programs honoring Dennis R. Atkinson, donor of more than 350 films to the LOC since 1969. Asked what title of his he most wanted to see, Atkinson had replied with one word: "Mawas," the first film he turned over to the LOC. So a private screening of it was arranged at noon for Dennis and his family. There was absolutely no information available on this film from any source I checked, so I was curious what it could be. I arrived about 11:30 a.m. to find the order of the reels being sorted out by running them on screen: scenes of jungle explorers stalking a leopard, or possibly vice versa. Turns out 'Mawas' was something of a stock footage festival. Someone had shot about ten minutes of guys sitting around a campfire somewhere out in the American West, swapping tales of far-off jungle lands. And the rest of the film was footage taken from other sources. Still, the print looked great, and it was fun to create music as the "drama" unfolded. Once I recognized the flashback structure and episodic nature of the film, it wasn't hard gauge the music to help make it work. I actually got kinda lost in the film, and worked up some big stuff as it built to something of a climax. So it was a little weird for the film to end, the lights to come up—and to have just four people in the theater. Many more turned out for the "public" program at 2 p.m.: three obscure comedy shorts and 'Twisted Triggers' (1926), a melodramatic Western. Having had the chance to warm up and get comfortable at the keyboard with 'Mawas,' I found myself more than ready for the rapid-fire comedy shorts, which were quite good. Notable was 'Ko Koo Kids,' which turned out to be a satire on the Ku Klux Klan, with members of a KKK-like group attempting to lynch the local schoolmaster for alleged hanky-panky with a young girl. Lots of alarming stuff in this one, but I had the presence of mind to swing into 'Ride of the Valkyries' when the townsfolk began donning white robes and hoods and jumping on horses. Speaking of horses: I really got into 'Twisted Triggers,' the featured attraction. Released by "Action Pictures," it lived up to its name, packed with one thrilling scene after another. This posses a challenge for the accompanist, in the sense that usually any movie has at least a few slower-paced scenes, which help you pace yourself and provide contrast to the action sequences. Not 'Twisted Triggers!' Any time things slowed down for what seemed to be a quiet scene, someone jumped on a horse and rode off to take care of some life-or-death situation. So I did my best to keep up, always holding back at least a little so I'd still have somewhere to go. It was only when the good guy and the bad guy wound up off their horses to fight one-on-one in a river that I felt we were at the true climax, which was my green light to go all out. This time there were people when the lights came up, and response was generous. While in mid-film, I'm often not sure how what I do comes across. But at the Atkinson screenings, I did feel I gave it my all, and that's a good feeling to have when the lights come up. Afterwards, Mr. Atkinson seemed delighted by the whole afternoon. It was a treat to talk with him and thank him for his donations over such a long span. at ... wait, where is this place again? Had a great time out in Niles, Calif. this weekend doing music for 'The Square Deal Man' (1917), a typically grim William S. Hart western. The show was Saturday, May 7 at the venerable Niles Essanay Silent Film Museum. That afternoon, I stopped by the museum to find myself pressed into service manning the front counter while a tour was given to a visiting group. I was there long enough to give a phone caller bad info about using public transportation to reach the Museum. But he called back later, and all was sorted out. I usually confine my damage to the keyboard, thank you very much. As is often the case at Niles, the evening program opened with a pair of short comedies. First up was 'Two-Gun Gussie' (1918), an early Lloyd "glasses character" one-reeler notable for its beginning. The film opens with a close-up of hands on a piano keyboard in the midst of playing something devilishly complicated. We discover it's Harold, a concert pianist. In full Paderewski mode, he wows the ladies by flinging himself at the keyboard, pausing for drama, and displaying a technique worthy of Chico Marx. For this, I basically improvised a dissonant farrago on the opening theme of Beethoven's 5th Symphony, doing my best to match Lloyd's flamboyant gestures. But I have to wonder how musicians handled this when the film was brand new, almost a century ago now. Probably the same way: not so much music but some kind of concert-hall sonic chaos to help the humor come across. More challenging was 'Curses' (1925) a two-reel Al St. John parody of dramatic serials that even then were seen as full of clichés and conventions. In scoring a film, I usually steer clear of what the general public might think of as "silent film music"—you know, that over-dramatic jangly piano sound. But in this case, the goofy satire cried out for exactly that. So off I went, channeling all the Dudley Do-right music I recall absorbing as a child. The best thing about this frantic parody (directed by no less than Roscoe 'Fatty' Arbuckle under the pseudonym William Goodrich) is how it's broken into several chapters, just like a real serial. Although instead of waiting until next week, we just have to wait a few seconds for the film to resume. It's very well done and lends a meta-air to the film that comes across as knowing and snarky even today. I'm familiar with this film in a DVD version produced by Paul Gierucki, which comes with intertitles that really punch up the comedy, I think. However, Niles showed an older 16mm print with intertitles that lacked the same impact, I felt. But it's a good example of how a sensitive restoration can make a difference in how a film plays. 'Curses' was enjoyed by all last Saturday night, but I felt the Gierucki titles would have made it click even more. The Hart film, which I'd never seen, turned out to be just as over-the-top as the Al St. John comedy. But in Hart's case, he really meant it. So I played it straight, building the score out of a pair melodic lines I brought with me: a "masculine" modal-sounding signature for Hart, and a "feminine" motif for more tender moments. A third unplanned melody, for the Mexican antagonist, added some Latin flavor to the scoring. So it all came together nicely. Although Hart films come across as a bit austere, I think people slowly became absorbed as the story unfolded. By the end, I think the audience was with 'The Square Deal Man,' and deservedly so. Although it's no 'Hell's Hinges,' it's one I'd certainly program and run again. Hart, by the way, is one of those performers I've yet to fully discover and appreciate. I've never done 'Tumbleweeds' (1925), his final film, which is supposed to be good. And although many titles are lost, enough survive so that there's plenty to explore. And Swanson and Keaton and Dressler and William S. Hart! No one pretended that what we were doing was art! Let me tell you, I can relate to that. By the way, kudos to my brother-in-law, who managed to get not one but two of his Facebook colleagues to attend the screening and check out the Niles Essanay Silent Film Museum. Employer-matched contributions can't be far behind, right? Looking forward to possibly being out there again in the fall: the first week of November seems to be my time. Depending on who gets elected, I may be in the process of fleeing. We'll have to see. Vintage viewing: the 1913 Edison theater where films are screened at the Essenay Silent Film Museum. 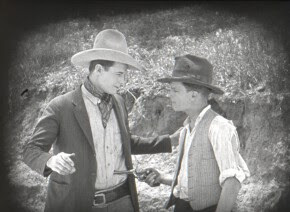 I'm heading West, young man (or whoever is reading this) to accompany a program this weekend at the venerable Niles Essanay Silent Film Museum out in the San Francisco Bay area. 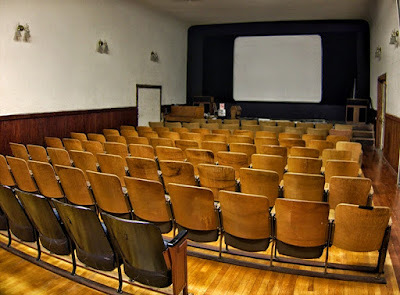 The Niles Museum is special in part because they're one of the few venues anywhere that runs silent film shows every week on a year-round basis. This gives them the chance to screen a wide variety of at-time obscure titles seldom shown elsewhere. 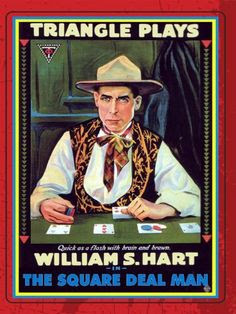 A good example is the program I'm accompanying on Saturday, May 7: the main attraction is 'The Square Deal Man,' a 1917 western starring William S. Hart as a professional gambler with the amazing name of Jack O. Diamonds. Geez, I wonder if he's ever been in a card game before? A pair of comedies round out the bill: 'Two-Gun Gussie,' an early Lloyd "glasses character" one-reeler from 1918, and 'Curses!' an Al St. John two-reeler from 1925 directed by Roscoe 'Fatty' Arbuckle in exile. Like I said: running silent films every week, you can't rely on 'Metropolis' or 'The General.' Niles gives all the other films a chance to be experienced as originally intended: on the big screen, with live music, and in a theater with an audience. I want to thank Dorothy Fields and all the other great folks at Niles for giving me the chance to do music there. I enjoy it so much, I almost feel guilty for programming 'Old San Francisco' (1927) earlier this year, a film which climaxes with a recreation of the 1906 earthquake that destroyed San Francisco. As an accompanist, what I like about Niles is that when I'm there, I get a sense I'm part of an ongoing tradition. For one thing, the town is where the Essanay company produced a lot of film in the 1910s, Also, the nickelodeon-style Edison theater itself (separate from the studio) was opened in 1913. And because silent film is run so regularly (as opposed to it being a special or "unusual" event), the place to me feels different from any other space in which I've accompanied silent film. I don't know. It might be the continuity of weekly programming causes some kind of silent film karma to build up over time. 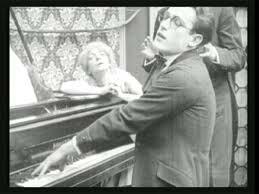 But sitting before the sturdy upright house piano, I find it amazingly easy to forget myself and slip into "silent film accompaniment" mode. Who knows? It might be the floor wax they use. But there's something special about the place, and I feel privileged to be able to return for another spell on the bench. 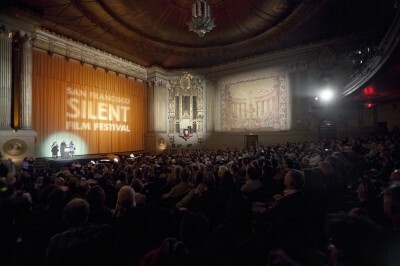 By the way, the only week the Niles theater suspends its silent schedule is the weekend of the big San Francisco Silent Film Festival, which this year is June 2-5. So any board members or others connected with this prestigious event: come check out the show in Niles this weekend. It's just a short ride across the Bay. Hey, an accompanist can dream, can't he? And there's this guy from the backwoods of New Hampshire who would love a chance to be considered for accompanist slots that open up for any future festivals. Hey, I'm accompanying William S. Hart this weekend. You're expecting subtlety? After I head back East, a glance at the calendar finds I'm accompanying pretty much a show every day from Thursday, May 12 through Saturday, May 21. Wow. I'm not sure how this happened, but I'm booked for nine separate performances during those 11 days, including two on Sunday, May 15. They're spread across four states: Maine, New Hampshire, Vermont, and Massachusetts. And the run culminates with a quick trip to the Packard Center of the Library of Congress in Culpeper, Va., where I'm doing music for an afternoon program on Saturday, May 21. But seriously—I'm delighted at the prospect of settling into a series of shows, as I find I gain fluency and confidence as the run wears on. Or at least I think so, anyway. And yes, you do get punchy. Sometimes, in the midst of a heavy accompaniment cycle, I find the reflex is hard to turn off. I find myself coming up with music as I go through daily life. Walking to the car in the parking lot: pesante octaves in the bass. Getting in the car: F major triad with a B natural to add a glint of light. But then again, it might be the floor wax.